Every day, websites lose the exposure they deserve to a problem that takes moments to solve: they ask readers to Like their content, when they should ask readers to Share it instead. A brand laden with Likes will reach a few percent of its fans each time it posts something on its brand page. However, a specific content page (e.g. an article) laden with Likes does not enable your content to reach many more people. Liking a piece of content is a near empty exchange. In contrast, the most valuable call to action you can ask of your readers is to Share your content. A Share provides reliable, high-quality word-of-mouth exposure – a Like does not. Clicking “Share” produces a message that goes out instantly to the sharer’s Facebook News Feed, and is seen many of the sharer’s friends. Clicking “Like” very rarely produces a message. A Facebook Share is a warm endorsement from one friend to another that your content matters. These endorsements quickly add up to real value for your site. Each Share produces many high quality referral clicks – the type of clicks you might normally buy for $0.25-$0.50 each from distribution platforms like Outbrain and Taboola. These clicks valuable clicks boost your exposure and engagement. 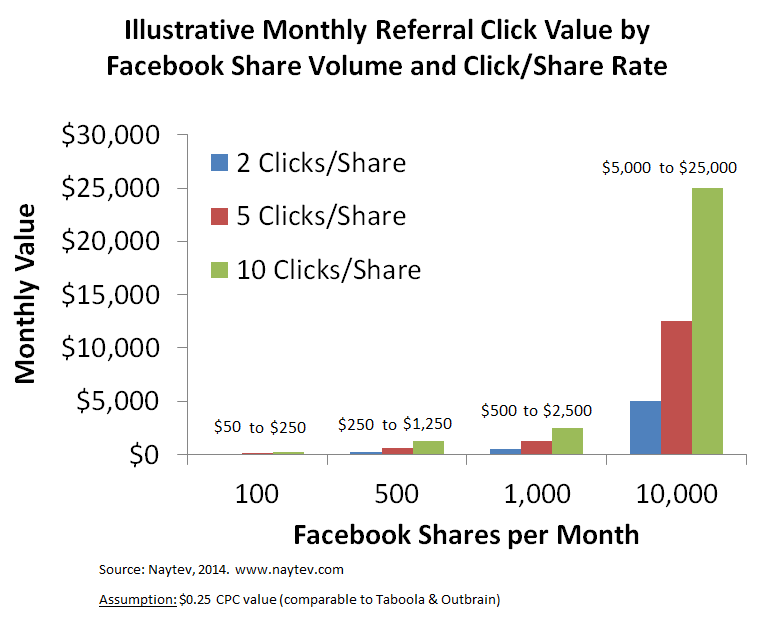 Let’s consider a quick example of total value of referral clicks from Facebook Shares over the course of one month. In this scenario, let’s assume we’re looking at a site that posts 1 article per day and gets 10 Facebook button Shares per article. We expect a site like this to see about 5 referral clicks per share. 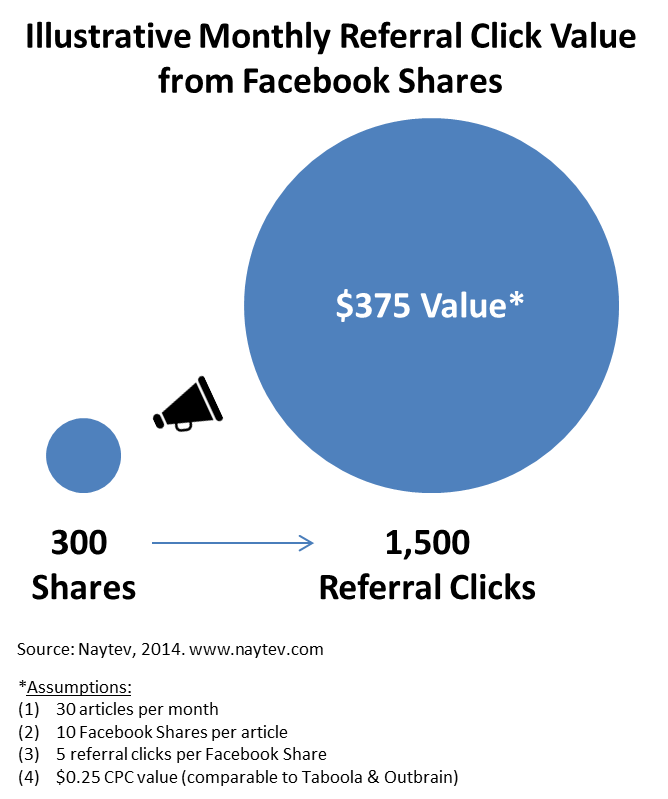 This is a simplified example, especially given that we assume each share receives an average of 5 referral clicks per share. This is an average rate that Naytev has observed across over 100 client sites, but rates can frequently be as low as 2 clicks/share and as high as 10 clicks/share. Where your site falls on this range, coupled with your monthly volume of Facebook shares, will greatly impact realized monthly value – see how in the chart below. Many people ask us where they can find their click per share rate. You will not find it in Google Analytics, but it is a core metric that Naytev tracks for our clients. If content Shares are the powerful lions of the social media savanna, content Likes are the cubs; fun to look at but otherwise, not likely to put in work. Every page containing content you want to reach the maximum audience should take advantage of Share buttons, not Like buttons. You can get the stock Facebook Share Button here. In our next blog post, we’ll cover best practices for integrating Share buttons with your page design.